The 2012 Summer Community Magazine was mailed this week and registration is now open for all summer programs, including our popular Morning Fun Camp. If residents did not receive the magazine yet, a PDF version is available online along with all the necessary registration forms. For more information, please call 856-488-7868 or email Recreation@CHTownship.com. On Saturday May 5th, Mayor Cahn, Assemblywoman Pamela Lampitt and Superintendent Reusche attended the 35th anniversary celebration of the Cherry Hill African American Civic Association at their Cherry Blossom Jazz Luncheon. At the luncheon, the Civic Association awarded scholarships to outstanding young people in the community. In honor of Volunteer Awareness Month, in Mayor Cahn's most recent weekly column, he took the opportunity to thank Cherry Hill's many volunteers for their hard work and dedication to our community. At the same time, Mayor Cahn invited Cherry Hill residents that are not already involved to participate in and take advantage of the many great volunteer opportunities and make a difference in our town. You can read more about opportunities to get involved by clicking HERE. The 2012 edition of Dancing with the Cherry Hill Stars was a huge success. On Sunday May 6th, the crowd enjoyed 16 dancing acts showcasing teachers, parents, community and business leaders, and students. 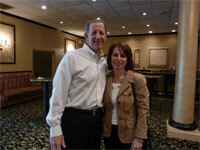 Mayor Cahn and Councilwoman Silver participated in the evening. First place winners with the highest fundraising total were Jenny Ryan and Joe DeMarco with Honorable Mention going to Jim D’Onofrio and Marta Audino. The Judges' Awards went to Susan Nicolazzo-Dollarton and Billy Hart for Best Overall Performance, Francis Mazeika and Debbie Rider for Most Creative Performance and Chi Ewusi and Christopher Pawling for Best Technical Performance. You can view photos on the Cherry Hill Education Foundation website. Breakfast is the most important meal of the day. That is why maintaining a healthy diet starts first thing in the morning, by eating a healthy breakfast. When you first wake up, your body is low on nutrients from sleeping, so eating a balanced breakfast of fruit, whole grains and protein is essential. Also, before you run out the door grab a water bottle. Water keeps you hydrated and keeps you from overeating. Make sure your water bottle is also BPA- Free. You can see more wellness tips and activities throughout Cherry Hill on the Mayor's Wellness page of the Township website. Chief Del Campo announced the passing of K-9 Franko (handled by Sgt. J. Kelly) on Tuesday May 8th. K-9 Franko came to the Cherry Hill Police from Czechoslovakia where he was specially bred for police work. He attended the Philadelphia Canine Academy and was a recipient of numerous awards and commendations throughout his term with the department. He faithfully served with Sgt. J. Kelly from September 25, 2000 to April 15, 2010. Cherry Hill is home to thirteen swim clubs located in neighborhoods around the Township. As the temperature rises and summer approaches, we encourage our residents to reach out to one of their neighborhood clubs. You can click HERE to get information about contacting a swim club near you and obtaining upcoming events including basketball, swim relays and volleyball tournaments. The Cherry Hill Public Library will hold a Notary Seminar on Wednesday, May 16 in the Library’s lower-level conference room. The beginner’s seminar will be held from 9:30 am – 12:30 pm; the advanced seminar will be from 12:30 pm-3:30 pm. You can get more information by clicking HERE. Veterans and active-duty military personnel will be honored by Mayor Chuck Cahn, Township Council and local elected officials at the Township's annual Memorial Day ceremony on Monday, May 28 at 11:00 am on the grounds of the Municipal Complex, 820 Mercer Street. The afternoon includes a memorial ceremony for the veterans we lost this year as well as a musical tribute to our Armed Forces by the Cherry Hill Pine Barons Chorus. Air National Guard Member and Camden County Freeholder Ian Leonard will deliver the keynote address. Following the patriotic ceremony, all attendees are welcomed to enjoy a free barbecue lunch provided by ShopRite Supermarkets of Cherry Hill. 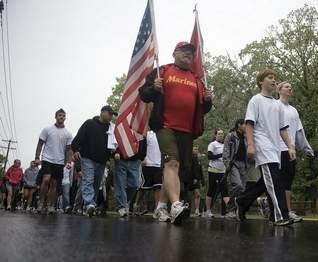 The event is sponsored by American Legion Post 372, Jewish War Veterans Furer-Barag-Wolf Post 126 and ShopRite Supermarkets of Cherry Hill. The ceremony is rain or shine. For more information, please call 856-488-7868 or email Events@CHTownship.com. Heating and cooling costs the average homeowner more than $1,000/year, nearly half the home’s total energy bill. If your air conditioner is over 15 years old, you can save on electric bills and improve your home’s energy efficiency by investing in new equipment. Since January 2006, all residential central air conditioners sold in the United States must have an Energy Efficiency Rating (SEER) of at least 13. ENERGY STAR qualified central air conditioners must have a SEER of at least 14. By upgrading from SEER 9 to SEER 14, you can reduce your energy consumption by more than 35%. The 2012 Summer Community Magazine was mailed this week and registration is now open for all summer programs, including our popular Morning Fun Camp. If residents did not receive the magazine yet, a PDF version is available online [http://www.cherryhill-nj.com/index.aspx?nid=127] along with all the necessary registration forms. For more information, please call 856-488-7868 or email Recreation@CHTownship.com [mailto: Recreation@CHTownship.com] . Cherry Hill is home to thirteen swim clubs located in neighborhoods around the Township. As the temperature rises and summer approaches, we encourage our residents to reach out to one of their neighborhood clubs. You can click HERE to get information [http://www.cherryhill-nj.com/DocumentView.aspx?DID=699] about contacting a swim club near you and obtaining upcoming events including basketball, swim relays and volleyball tournaments.